Posted December 17, 2012 by Advisory Board & filed under Uncategorized. My involvement with the Paprika Festival was spurred on by a desire to be a part of something different. I wanted to learn more about the world of theater and I wanted to get an inside look at the administrative side of running a festival. Most of all, I wanted to show my support for this community. Prior to my interest in the festival, I had no interaction with the theater community of any kind. Luckily for me, the theater enthusiast is a personable and extroverted breed of artist. At every board meeting or training day, I find that it takes no time at all to be approached by the friendly face of someone I’ve never met before. – How do we make a successful life for ourselves in the arts? – How should we define success? – How do we know if we’re any good? These questions are inextricable from the process of making your private creations public. Artists are defined by how they approach these questions. Personally, I dream of what it will be like to have the weight of these questions lifted off of my chest. The future is a precarious destination for a young artist. 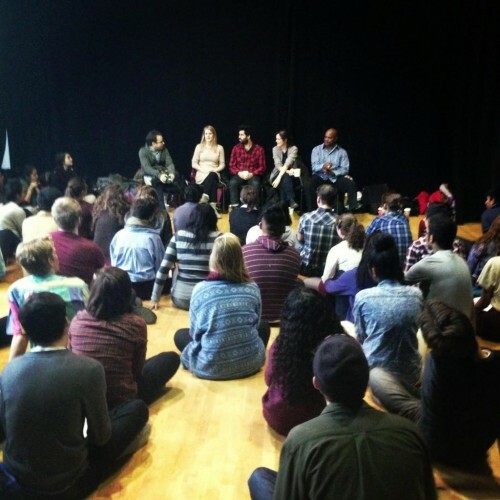 At our last training day, we were treated to a panel discussion that was comprised of four people who have managed to build a life around their passion for theater. The panelists were Heather Marie Annis, Martha Ross, Adam Paolozza and Sterling Jarvis. They spoke of their personal experiences with the world of theater and they provided some insight into what young artists might be up against. It was certainly a welcome change of pace to have adults encouraging young people to get involved with the arts. An encouraging word is hard to come by when you’re trying to become an artist. So naturally, we were all riveted to hear what they had to say. The subject matter of the discussion was based specifically in the world of theater. However, there were some very important pieces of advice that proved to relate with any artistic endeavor. Ideas that transcend any one practice are the strongest lessons to take into consideration. 1. There’s no one way to do it. When looking at the four panelists, I realized that I was looking at four people who had succeeded in four different ways. They had each made their own path to success, and they each had their own definitions of what it meant to be successful. The thing about being an artist is that there’s nowhere to hand in your resume for some internship program. You don’t apply to be a playwright and you don’t go through an interview process. You write the play, and if you care enough about it you’ll find a way to put it on. Creativity is not limited to the artwork itself. You have to be creative when it comes to putting it out into the world. A word of warning should come with this tip. Since everyone is producing their work in a different way, this means that everyone around you will have something to say about how you’re doing it. These opinions will not always be supportive. This brings me to the second lesson of the day. Now, this doesn’t mean that you should stop caring about your work or that you should aimlessly wander through this world with some sort of existential irreverence. It just means that when it comes to your work, you should only take your inspiration seriously. Stay true to it and don’t let other people’s opinions slow you down. People will have all sorts of reasons to say negative things about what you might be trying to do, and in most instances those reasons are tied into things that are out of your control. Criticism can be helpful but be wary of the things that are resentful. Have the wherewithal to understand the difference between what’s constructive and what’s malicious. If you’re going to be an artist, this is one of the luxuries that you have to look forward to. If you can learn to create your own opportunity, then you will always be your own boss. It should be noted that success in the arts has a lot to do with luck. However, a lot of hard work goes into being in the right place at the right time. A lot of talent helps out when it come to taking advantage of those situations too. It takes persistence and dedication to turn luck into your favour. That’s what making your own work is all about. These three lessons really struck me on a personal level. I have been thinking a lot about these issues and it was the kind of advice that I needed to hear from someone with more experience than myself. The Paprika Festival has done a great thing for young artists. They have provided them with a platform to prove their initiative and their talent. They have also connected them to community that fosters this type of creativity. That is a true gift. Graham Nicholas is a musician and a member of Paprika’s Advisory Board. Find him at https://www.facebook.com/grahamnicholasmusic.